The anchor to the right is the STAD4432. This is a temporary anchor. What makes this a temporary anchor is that it does not have the compactor, so it will not compact the soil between the top two flites. 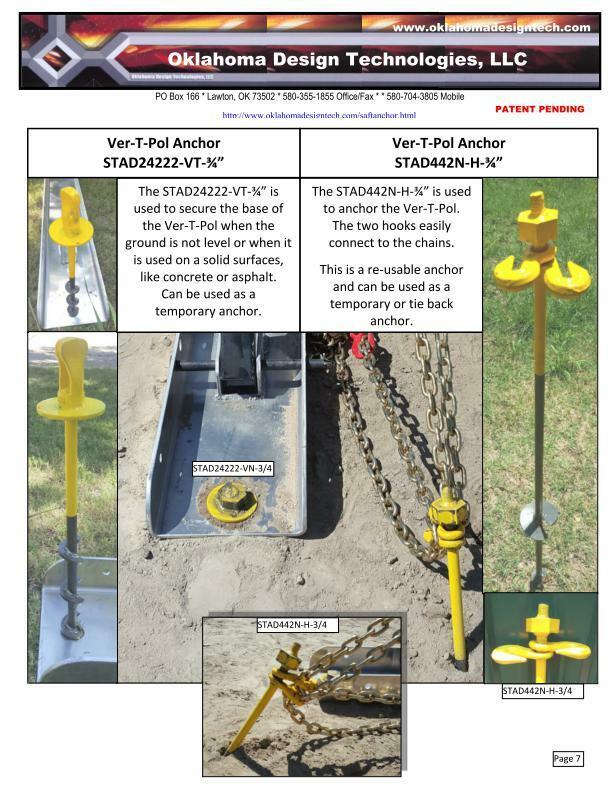 This anchor is used with the VER-T-POL so that it can be installed and removed repeatedly. The STAD442 can be ordered with the thimble eye nut, with the eye nut, with only the 2" nut or with the 2" nut and the hooks. The eye nut and the 2" nut with the hooks are used with the VER-T-POL to secure the chains. The anchor to the right is the STAD232. This is a temporary anchor often referred to as the tie back anchor. This anchor is used when a damaged pole is in an area where a truck is inaccessible or in an emergency situation. Install this anchor to secure the damaged pole until the correct sized anchor can be installed or until the pole can be changed out safely. Another use for the STAD232 is for grounding trucks while working near live electrical utilities.